I’d signed up for the Longest Day Run months ago without really thinking about it, and after roping in a pal, Jen, to join me, we decided to go for about 40-50 miles. She’d never run more than a marathon, and me not further than 34 miles, so it was going to be a test for both of us. We’d also never run together, but knew that we had a 5 minute difference in marathon finishing times so couldn’t be that much different. The week of the run had arrived and I didn’t even feel nervous, even went out for 2 run commutes and a sprint session on Monday night, which very nearly put an end to things as I pulled my right calf when pushing off for a sprint. Spent some time icing that and I was blessed to receive a call from G4Physio asking me to come & have a 1/2 hr massage for free, they had a new therapist that they wanted me to try and give some feedback on, Oh yes please! Wouldn’t say no to that offer, and boy did Sarah do a great job, she sorted out my calf and then some! Looking pretty pleased with my delivery! I didn’t even really carb up like I would before a marathon, normally starting 3 days before; I did have pasta for both lunch & dinner on Friday and increased my hydration on Friday. 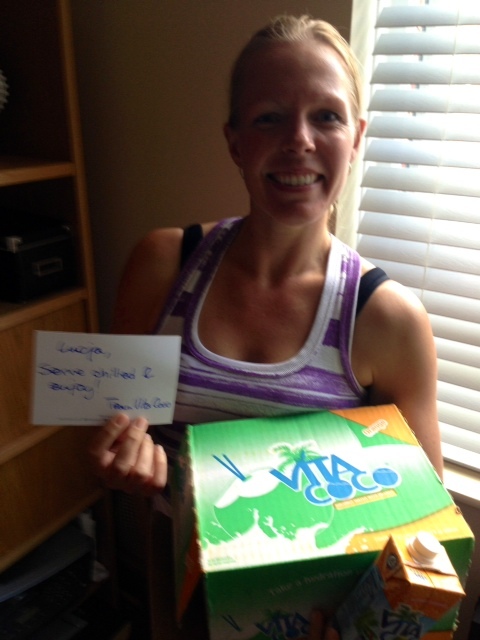 Made all the more easier by a fantastic delivery from Vita Coco full of hydrating coconut goodness. I think the lack of nerves was down to the fact that it wasn’t really a race, just a challenge, so there was no pressure. We met and hit the canal path at 8.30am. We ran from Kidsgrove along the Macclesfield canal, taking us through Congleton, Macclesfield, High Lane through to Marple which was at about 27 miles. We had a short rain shower along the way, but apart from that one we had pretty good weather the entire way. My goal of today was to work on my long distance nutrition too, and to make sure that I ate something every 5 miles as this is one of my weak spots, I tend to stop eating after about 15 miles and then start to suffer after 25 when the fuel tank is empty! I had a variety of food for the trek, with a mixture of Clif double espresso gel, 9 Bar, Salted pretzels, Salami stick & pork crackling; all of which worked really well. I find I like the sweet options for the first few feeds, but then have a craving for salty, savoury items. This was my first try of pork crackling along the way and this worked a treat. I hydrated with my camelbak filled with Nuun Kola flavour and this worked really well up until about 35 miles, when I started craving plain water. This will be solved when I get my pack for Kalahari as it will have 2 water bottles on the front, so I can have one with Nuun and one without, so I still get my electrolytes and some flavour but can mix it up depending on what I feel like. 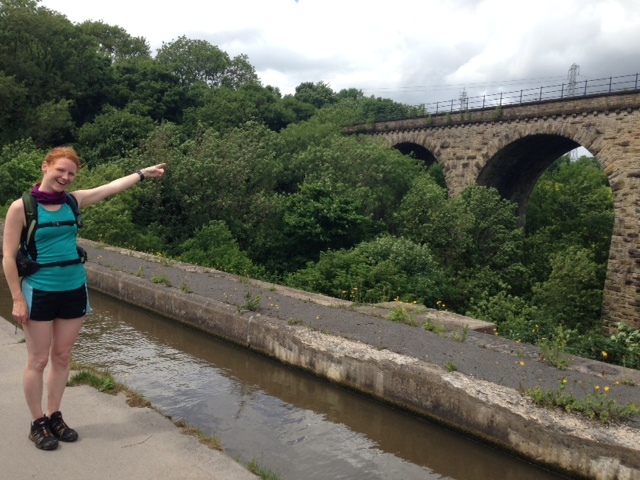 That’s the viaduct, & the aqueduct is beside me – Thanks Jen for the lesson! We stopped in Marple and met up with my Mother in Law and her partner for a well deserved cup of hot, sweet tea and some crumpets for me, and Bakewell tart for Jen. After a half hour rest, sufficiently refuelled and seizing up, we made a comic departure with our stiff bodies struggling to find the momentum again and got onto the Peak Forest Canal. Out momentum did come back after about a mile and we carried on running & chatting, with a few more stops to stretch out our tired muscles. At about 36 miles we were onto our 3rd and final canal, the Ashton canal, one I know well as I run this as part of my run to work, so it was nice to see familiar signs. We pushed onto Manchester and made it to Piccadilly Station spot on 43 miles in 7h39mins. Elated & exhausted we hugged each other, causing a spectacle of people wondering what on earth we had just done. We made our separate ways home, and I ‘treated’ myself to an ice bath before my hot shower. OMG! Try getting your tired body into a bath full of cold water without screaming, I couldn’t, I wonder what the neighbours thought! My cat was in a panic, worried because I was shrieking so much! After about 5 mins all was good and I settled in for a soak. It definitely works for me followed by sleeping in my compression tights; my muscles the day after felt pretty good, I was taking stairs as normal and wasn’t overly sore. A total of 61 miles for the week! Unbelievable, epic achievement. I am really pleased with how my training is progressing and I am becoming stronger and able to endure more every time. It is great to see the progress happening. As one of my colleagues put it; “Your long runs are like our nights out on the razz, you get all pumped up, go out & run, then recover!”. I think that’s the perfect way to describe it! 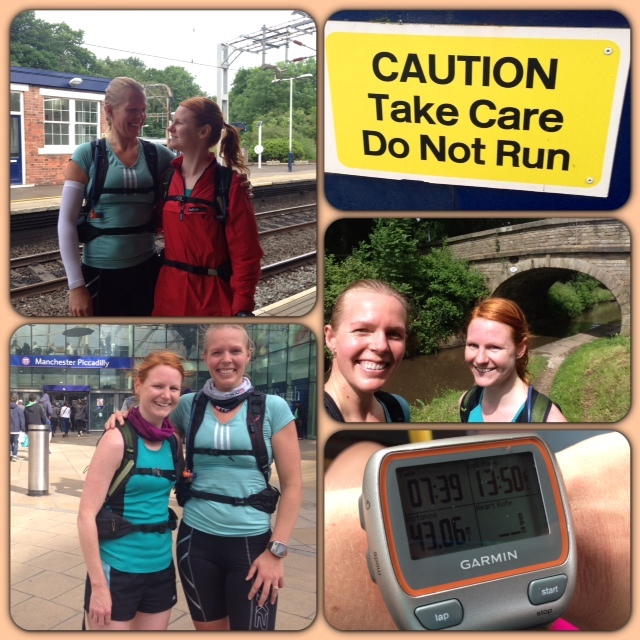 From the start gazing thoughtfully at each other at Kidsgrove to Manchester Piccadilly station – 43 miles!